How much does $100 million buy when it comes to bikeways? Team Quirk make much of their $100 million 4-year commitment to Better Bikeways for Brisbane, but as we approach the middle of the current Council term we’ve been reviewing progress – and frankly it’s bit underwhelming. Check out our interactive map. Obviously there are still a few significant projects still in planning stage – such as the Woolloongabba Bikeway, and Indooroopilly Bikeway along Radnor St. There are also some “splurge” projects in the works that seem to be a race to spend money of no particular benefit to anyone: most prominently the Land St tunnel duplication which is in planning phase. Some of what has already been delivered makes a dubious contribution to network connectivity, including the concrete shared path next to Pritchard St at Lytton (which fails to connect anywhere safe) and the few metres of separated path along Shand St, Stafford which is great for those heading to the local dog park but of limited value to anyone wanting to simply ride through the area. It’s certainly not all negative; a couple of projects provide links where there was previously no safe passage. These include the Salisbury Bikeway Stage 2 (technically a shared path), and the path along Gympie Road through Marchant Park – although that will require the next link through to Aspley before its full value is realised. Council have delivered a number of helpful lighting projects, including along the Enoggera Creek Bikeway at Windsor, Bulimba Creek Bikeway at Carindale, and through Amazon Place Park at Jindalee. But some of Brisbane’s major routes have been left in the dark. Frustratingly these include the main route to the northside behind the Grammar Schools, and the supposed “CBD to Carindale Commuter Bikeway Corridor” though Woolloongabba and Coorparoo. This bridge at Akuna St, Kenmore replaces an older, narrow bridge in the same location. But the million dollar price tag seems steep. We’re a little confused about what projects are included in the budget earmarked for “better bikeways” – which seems to include “Bridges and Culvert Construction – New” but not “Bridges and Culverts Reconstruction and Rehabilitation”, even though most projects from both categories simply replace local pedestrian bridges which are deteriorating beyond repair. We’re not complaining about the old narrow bridges at Akuna St and Katunga St Kenmore being replaced with new 3m wide structures that can be more comfortably shared by people walking and cycling, but consider it preposterous that those bridges could cost over $1 million each as indicated in Council’s budget papers. Cyclists working at the airport, or travelling between the north side and the Gateway Bridge are still locked out at the end of Viola Place. Perhaps most concerning is where the millions set aside in consecutive budgets for critical connections such as Scheider Rd to Viola Place, and Council’s contribution to the next stage of the North Brisbane Bikeway to Price St have been diverted. 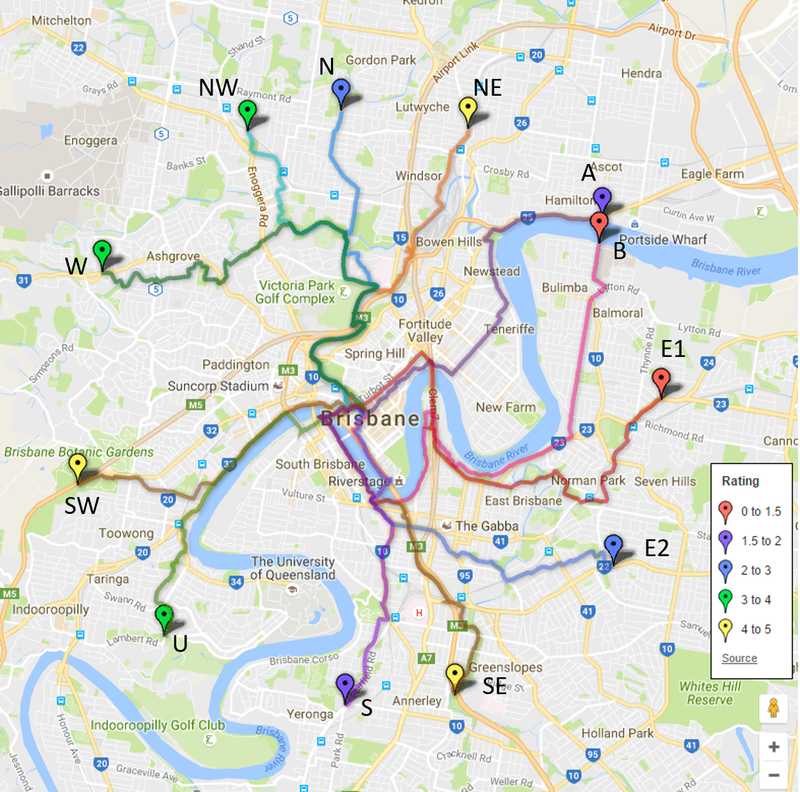 After two years, the Better Bikeways for Brisbane program has so far only delivered 4.0km of new bikeway. And in fact all of that is technically shared path, with the exception of 700m along Kedron Brook between Fifth Ave and Shaw Road where the existing shared path has been duplicated to provide welcome separation between cyclists and people (and dogs) walking and running. At this rate we are afraid it will be centuries before Brisbane has a comprehensive cycling network – and clearly we can’t afford it. This is why our campaign for the next Council election will focus on high-value projects, and finding space for cycling along main corridors where protected bike lanes can be achieved with maximum impact, and minimal expense if only Council is prepared to remove the tyranny of “free” parking in valuable public space. Details of Brisbane City Council’s budget are available in the “Appendix of Schedules” paper which is available online for 2016/2017 and 2017/18.